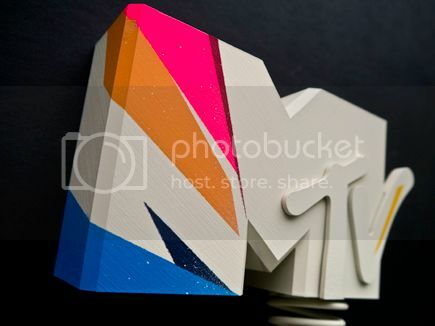 A diverse selection of leading contemporary artists and designers have come together to redesign the iconic MTV EMA to help raise money for the MTV Staying Alive Foundation at a special charity event on Saturday 2 November in London. In conjunction with curators at The Future Tense, artists Yinka Shonibare, Ryan Gander, Dave White, D*Face, Remi Rough and Lee Broom along with Sabine Roemer and Philip Michael Wolfson have all taken the award and personalised them, finding inspiration from a variety of sources. Sabine Roemer worked with Gemfields’ Zambian emeralds to produce a stunning version featuring a bird with two one-carat emeralds on its tail, whilst Swarovksi partnered with Philip Michael Wolfson to create a Superman-inspired piece. 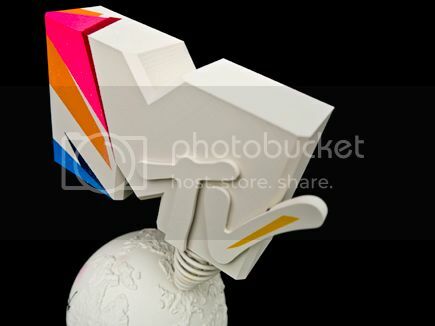 Dave White took inspiration from his recent Endangered Species series to recreate the camouflage of the Amur Leopard, and Ryan Gander produced a free-standing table lamp as part of an on-going series where the conceptual artist attempts to produce functional objects in an ad hoc manner. 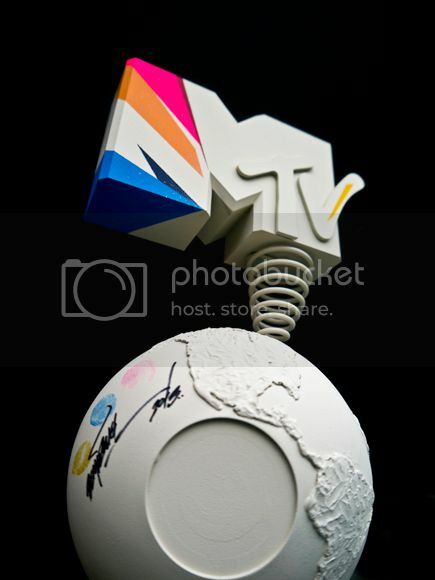 The EMA is the world famous award handed out to winners at MTV’s annual global music awards show, which has showcased the hottest acts in music in a different European city each year since 1994. This year’s EMA show will take place at The Ziggo Dome in Amsterdam on Sunday 10th November. These specially designed, one-off awards will be auctioned at a special gala event alongside an impressive range of money-can’t-buy lots, including training with the Manchester City F.C. Elite Development squad, a pair of VIP tickets to the MTV Movie Awards in Los Angeles including business class flights with American Airlines, a game of tennis on the hallowed courts of Wimbledon with Tim Henman and the chance to take on Chess Grandmaster, Garry Kasparov, 38-storeys high at SushiSamba.